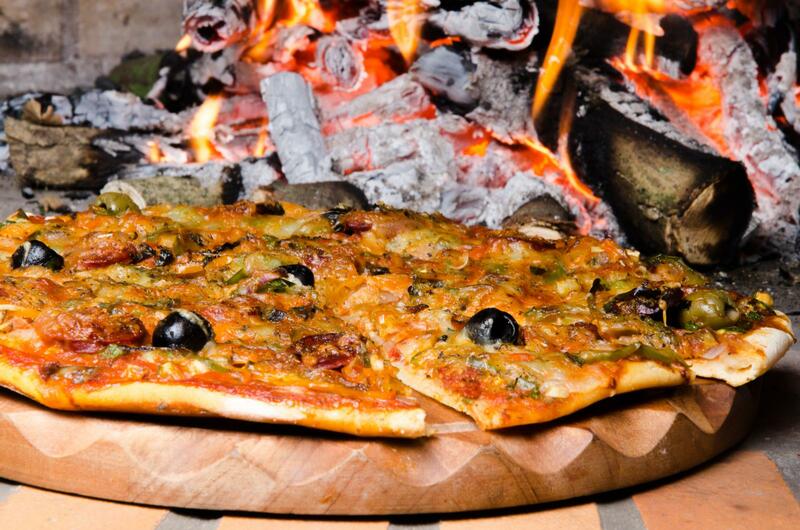 Forget the burgers and wrap up your summer with some delicious grilled pizza. Follow the steps below to get pizzeria-quality, soft and airy, crisp, well-charred, smoky pies at home. Roll out and stretch your dough as thin as possible, then grill one side and flip before topping it. Prepare your toppings in advance. Par-cook or pre-cook as needed, as the pizza will not be on the grill long enough to cook your ingredients. Avoid over-loading and anything wet. Weighing down your pizza with too much sauce, fresh cheeses, and too many toppings will results in a soggy, undercooked pizza. Beyond that, the world is your oyster. Use our recipe as a guideline, but don’t hesitate to get creative. One of the best things about grilled pizza is letting everyone make their own, to their own tastes and preferences. Any type of pizza dough will work on the grill. You can use store-bought, fresh pizza dough, or make your own with the recipe below. Mix together the water and yeast in a large mixing bowl and let stand for a few minutes until the yeast is dissolved. Stir the oil into the yeast mixture, then add the flour and salt. Mix with until a shaggy, floury dough is formed. Using a mixer and dough hook or by hand, knead the dough until it forms into a smooth ball and springs slowly back when poked, about 5 to 8 minutes. Cut the dough into 8 lumps, lightly coat with oil, and place on a greased baking pan. Cover the pan with plastic wrap or a damp kitchen towel. Let the dough rise at room temperature for 1 to 1 1/2 hours, or until it has doubled in bulk, or place the covered pan immediately in the refrigerator and let it rise slowly overnight or up to 24 hours. Heat your grill. Ideally, a closed grill should read at least 550°f. If possible, divide your grill into direct and indirect halves, so that you have enough room to start your pizza over direct heat, then flip to finish over indirect heat. Divide the dough into 3 equal pieces. Lightly flour your rolling surface and flatten one of the pieces. Use a rolling pin to roll the dough into a 16-inch round, rotating and stretching the dough as you go. Transfer the dough to a lightly floured pizza peel (or use the bottom of a baking tray) and stretch to re-shape if necessary. Lightly brush the top of your pizza with olive oil. Flip the pizza oil-side down onto the direct heat side of the grill. Season both sides of the tomato slices with salt & freshly ground pepper. Oil your grill and place your tomato slices over direct heat. When your pizza has formed a crust on the underside, flip it onto the indirect heat side of the grill. Gently remove the tomato slices (careful, they will be mushy!) and place onto the grilled top of the pizza. Use your spatula to smoosh the tomatoes and spread over the surface of your pizza. Sprinkle the garlic over the tomatoes, then top with cheese, sausage, and fennel. Cover and let your pizza bake until cheese has melted, and bottom of pizza has become crispy. Wine with pizza is like beer with fish and chips… it’s just meant to be. The lush dark fruit flavors and spicy anise and cedar aromas work well with a fennel-driven sausage. This also makes a great grilling option for vegetarians and vegans -- just go with pre-grilled vegetables in place of meats and cheeses or pack on the umami with mushrooms, roasted nuts, and olives.